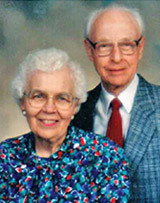 Marie and Kenneth Young’s bequest will support youth and Centenary United Church. Kenneth Young first dropped in to Hamilton Community Foundation with a list of questions about HCF’s accounting methods and investment practices. Only after he was completely satisfied that the Foundation’s policies were solid did he continue discussion about setting up a fund. That careful diligence doesn’t surprise Colin Lazier, Mr. Young’s lawyer and friend of 30 years. Mr. Young first learned about HCF when Mrs. Joyce Young made her record-setting gift of $40 million in 2000. People asked him if they were related (they’re not). The news coverage piqued his interest and he researched the Foundation, ultimately leaving a bequest in his will. Kenneth and his wife Marie moved to Hamilton from the Prairies, where they had both grown up. They met in Regina through speedskating – a sport they shared – and married in 1958. In 1961, Ken was transferred to Hamilton with International Harvester. They moved into a newly-built apartment on the Mountain brow, and never moved again. Ken was still living there independently (paying close attention to his nutrition and carefully reading food labels in his weekly shopping trips) in 2008 when he passed away in his ninety-third year. Marie pre-deceased him in 2002. Both were very active in Centenary United Church. Marie was a strong supporter of the United Church Women. Ken was a long-serving Clerk of Session, and a trustee and treasurer of Centenary’s bursary program for theological students. He also served on the United Church’s Hamilton-wide council for many years. Though they had no children of their own, Ken and Marie recognized the important influence of strong parents on their own lives and wanted to help make sure that other children had access to that kind of mentoring. The Kenneth Boothe Young and Marie Catherine Young Fund will support youth-focused grants recommended by the Foundation as well as the activities of Centenary United Church.